The LYSAGHT Living Collection® range of patios, verandahs and carport structures is a steel based home improvement range manufactured by BlueScope Lysaght and backed by Australia’s leading steel manufacturer, BlueScope Steel. BlueScope Lysaght is one of Australia’s largest rollforming operations and produces and markets the extensive range of LYSAGHT® rollformed steel building and industrial products throughout Australia. 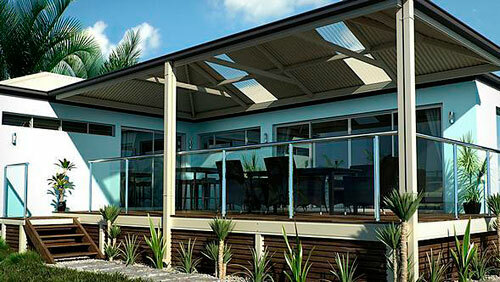 The LYSAGHT® name is one of the most respected and enduring in the Australian building industry. For more than 150 years, LYSAGHT® products have played a major role in the development of the unique style of architecture that dominates the Australian landscape. The company pioneered the introduction of corrugated steel roofing in Australia and has continued to lead the market with industry changing product developments. Steel roofing and walling products made of COLORBOND® steel are probably the most visible, but this business also supplies purlins and girts, structural decking, steel rainwater goods, fencing and a range of light steel sections as house framing components. Products like LYSAGHT FLATDEK® and LYSAGHT FIRMLOK® are designed specifically for the home improvement market to ensure home owners have a strong, durable, low maintenance solution for their outdoor living structures. The LYSAGHT Living Collection® range of patios, verandahs and carports is new in name, however, the technology and software has been in development by BlueScope owned businesses for over 30 years. Constructed exclusively from LYSAGHT® products manufactured from COLORBOND® steel, a LYSAGHT Living Collection® patio, verandah or carport is fully engineered by BlueScope experts to meet Australian Standards and checked for structural integrity – providing peace of mind your getting an Australian made structure designed for Australian conditions.